All the necessary paperwork to apply to ride in a Point-to-Point race is available on this page. All riders must have an RQC for the current year before they can ride in Point-to-Points. The RQC is proof that riders are qualified to ride in Point-to-Points and that they have paid the premium of the mandatory Point-to-Point Riders Insurance Scheme. Please note: In addition to the above categories, applicants may be required to submit subsequent Medical Forms at the discretion of the BHA Chief Medical Adviser / PPA Senior Medical Officer and in consideration of their medical history. Once you have completed the paperwork you should contact the relevant person in the Hunt with whom you qualified. Every Hunt which has "Confined Hunt" Status and who can therefore issue paperwork relating to Riders has supplied two signatures that will be accepted by the PPA. Any signature that does not match what we have on file cannot be accepted, and your application will be returned. Details of the signatories for each Hunt are listed in the downloadable document below with contact numbers as and where permission has been given to advertise them. All paperwork, including that relating to the Medical part of the application, should be returned to the PPA. The PPA Medical Advisor will assess the medical part of your application. Anything they have concerns about will be referred to the BHA Chief Medical Advisor and you will be informed accordingly. Riders should allow at least ten working days for their licence to be processed. If there is a problem with your application or further information is required the process may take considerably longer. To avoid disappointment, we encourage Riders to apply in good time. Following medical clearance, a successful assessment and payment being received, your RQC will be issued. Please ensure you put the correct postage on your application when returning it. Fines for underpaid postage will not be paid by the PPA and therefore your application will not be delivered. By reading a) and b) you should be familiar with all that is required. 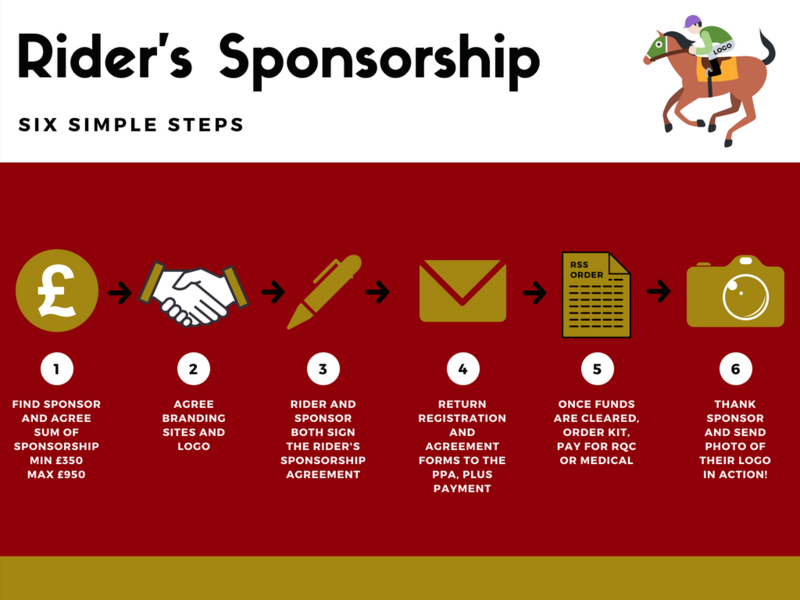 If a sponsor is forthcoming you will need to complete both the RSS1 Form and the Sponsorship Agreement returning them both to the PPA and pay the sponsorship money either by cheque or via BACS so the sponsorship can be formally registered. If something needs further clarification you will be contacted via email (preferable) or telephone. Once the registration has been confirmed you can order the necessary racing kit via the RSS Order Form which again must be returned to the PPA to be processed. If you wish to use some of your sponsorship funds to cover the cost of your RQC / medical (if you require one) you will need to highlight the necessary box on the RQC application form and / or provide a receipt from your GP relating to the medical you had with them along with the bank details you wish the money to be paid to. All of the forms can be downloaded and emailed or posted to the PPA.